After inviting application for Dev Vihar residential plots scheme, Jaipur Development Authority has launched another scheme with the name, JDA Pannadhai Nagar Residential Plot Scheme 2017. Under the scheme, the JDA Jaipur has offering housing units for window, unmarried women having an age of 40 years or belonging to EWS category. Online registration for residential plots in JDA Pannadhai Nagar Yojana, Block-D has been started from 20 November and last date of submitting the online application is 19 December 2017. In JDA Pannadhai Nagar Yojana, total 349 residential plots are being offered for sale which are available in the size of 45 square meter. 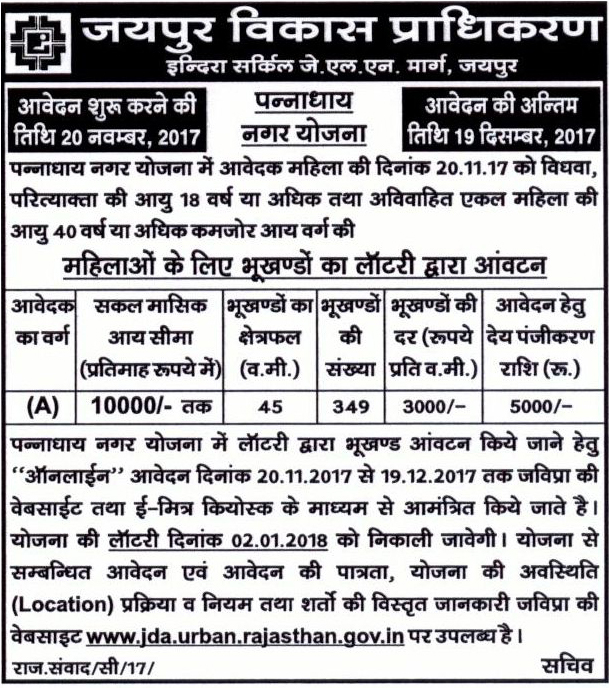 Process of registration of residential plots in JDA new housing scheme 2017 has been started and interested applicants can apply online through the official website of JDA Jaipur at jda.urban.rajasthan.gov.in. Follow the steps to fill the online application form for plot in the scheme. Now click at “Apply for Registration”. After that click at I Agree button to continue the registration. Here enter your information and mobile number to verify your registration. Now you will receive an OTP for verification. Enter it in the required field. After that the registration form will be appeared on the screen. Fill the application form with correct information and submit. Subsequently, you will have to make payment of registration fees. You can choose the online and offline mode of payment to pay the EMD. Interested one use the direct link given below to fill the online application and the facility is also available in KIOSK centres from where you can apply for the scheme. Lottery Result: 2 January 2018.